Can a steakhouse be more famous for what happened outside it than what's inside it? Sparks Steakhouse is somewhat infamous. Can a steakhouse be more famous for what was served up outside its doors than what is served up inside? My guess is that Sparks is living proof that the answer is yes. For the uninitiated, Sparks is infamous because in 1985 Gambino family boss Paul Castellano was gunned down a few steps away from the awning as he was walking in to get dinner. I’ve a hunch that Sparks does a lot of trade based on the Castellano hit, because what’s served up inside, in my view, doesn’t compare remotely with what gets served up at the big boys in town: Keens and Peter Luger. 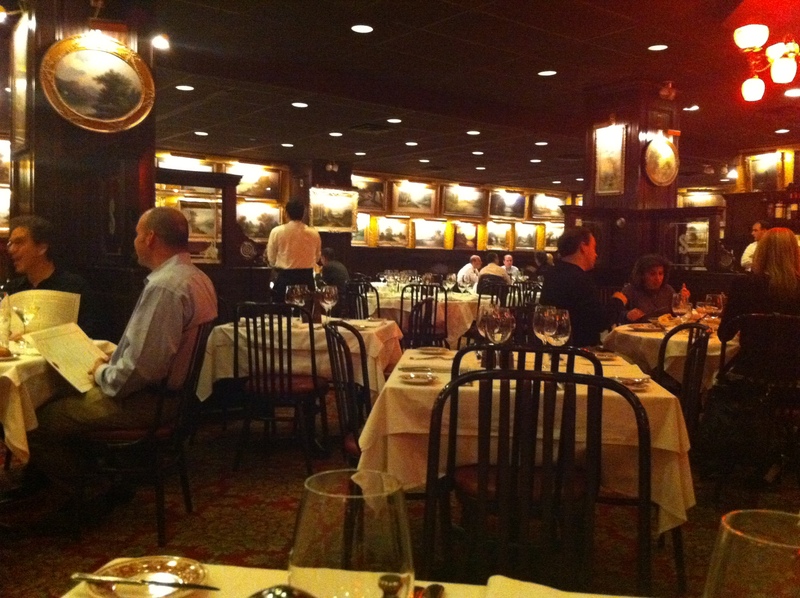 The interior decor and level of service reek of classic steakhouse excellence. Inside, Sparks is well impressive. It looks and feels like a steakhouse should. Whereas Keens favors clips from newspapers from yesteryear and Lugers enjoys straightforward wood wainscoting, Sparks offers up a large number of paintings cluttering the walls, offering pleasant vistas. The achievement is particularly impressive as Sparks is a modern steakhouse – opened in the ’60s, although it has been in its current location since the late ’70s. The waiters are all wear white shirts and their level of service I would say on the whole is excellent. The place has a positive feel, a spacious bar, and seems like a generally pleasant place to stop for a bite. Lamentably, the food is not so good. Who ordered the mozzerella and tomato? I don't know, but it was delicious. The first thing I noticed was that there is NO BACON on the menu at Sparks. Perhaps it is an “off the menu” item, but I have to say it is a bold decision for a steakhouse in New York City to not plant a flag in the bacon camp. After all, the Lugers bacon is legendary, and it seems like every other shop in town is chasing that dragon. Well, that rationale (as it turns out) is wrong: Sparks doesn’t even try. Very bold. Instead my compadres ordered the mozzerella and tomato. I wouldn’t have, but I’m glad they did, because it was delicious. 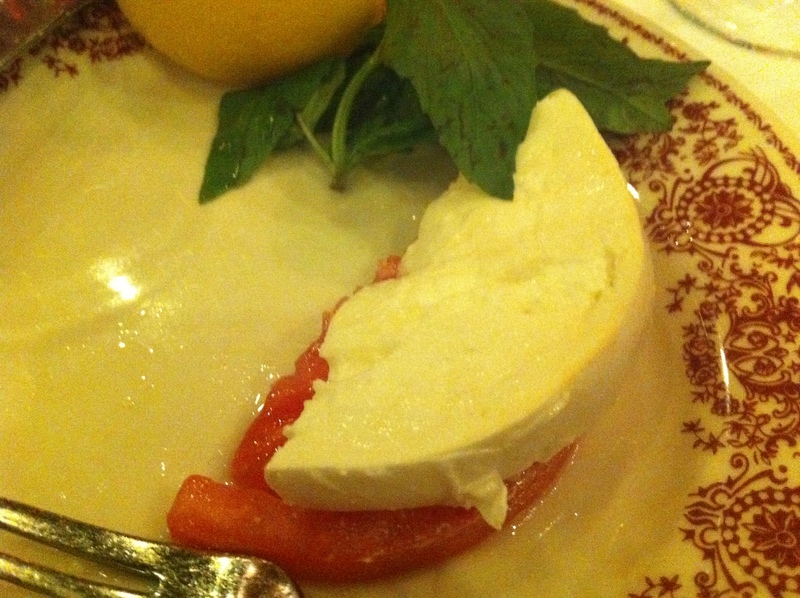 The mozzerella in particular was delightful: Light, loose, fluffy, creamy and flavorful. Sorry about the lousy color of the picture, but a great presentation for the crab and shrimp. We also indulged in some shrimp and crab for the table. Those appetizers were ordered separately, but I thought Sparks did a nice job of presenting them together. 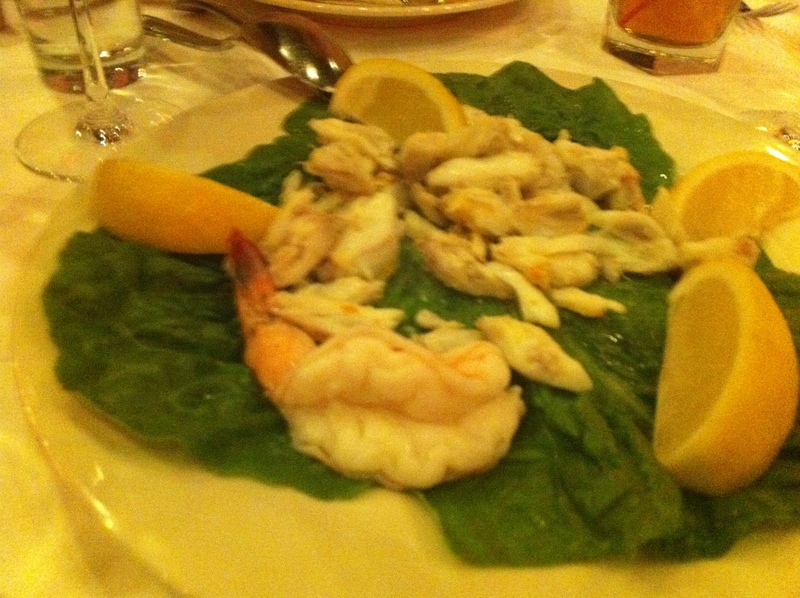 The four shrimp surrounded a large mound of crabmeat on a single plate. It’s smart service, especially for sharing. That said, while the crabmeat was well suitable and tasty, I found the shrimp – served split open down the back – were a bit more mealy and lacked the crisp pop you can find at Keens and Lugers. Perhaps that’s a function of how they are served, cut open that way, but on this night they didn’t compete with the big boys. So at this point in the meal, the food was holding up basically well enough, although the group had a collective “WTF” moment about the lack of bacon, and the shrimp were a bit lacking. At the suggestion of a waiter, we ordered the lamb chops, and I am glad they did, because they were also delicious. It turns out they were better than the steak. The lamb chops were a surprising winner. 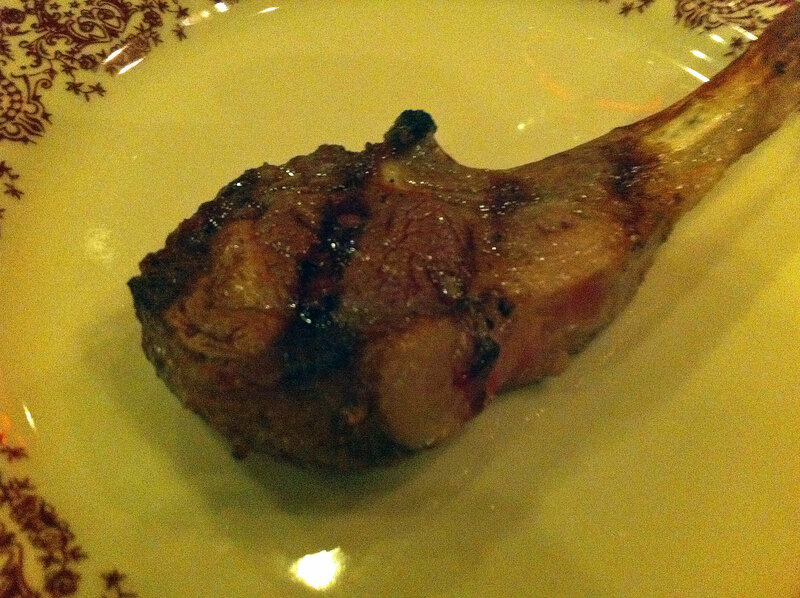 The chops had a great meaty flavor and a suitable char note, without being overcooked. They were also on the thick side (without being too much so), making them suitable for fork and knife cutting as opposed to just picking them up by the bone and chowing down. But on to the main: the steak. Sparks is famous for its sirloin steak. They don’t serve a Porterhouse, again choosing the path more seldom trod in a city whose steakhouses live in the shadow of Peter Luger. Good char, but too much fatty gristle. What you are looking at in the above picture is two of their signature sirloin steaks, which they’ve cut up. On the left you have the medium rare, on the right the medium (which of my group ordered medium?). 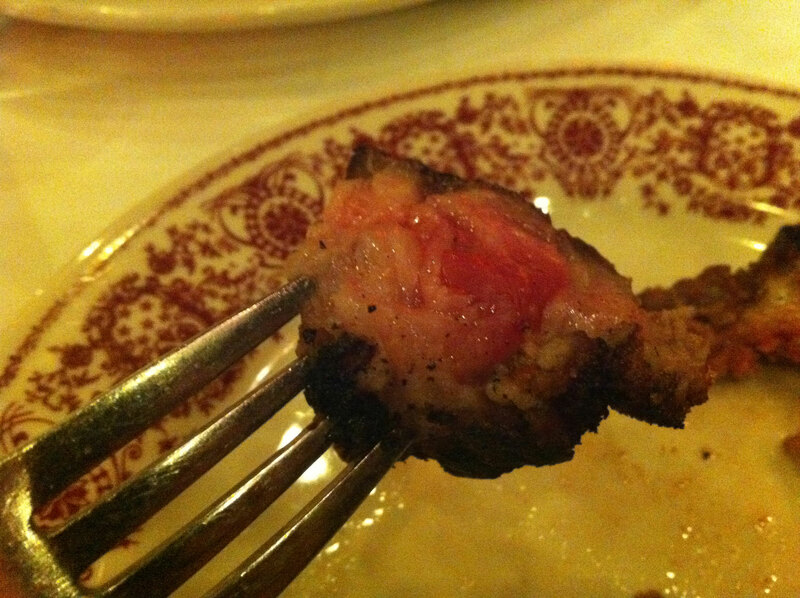 As you can see in the photo, the steak has a very good char, but… look closer. Take a look at the second piece on the left above. Do you see all that fat? That’s ridiculous. If their signature steak is a sirloin, I find myself wondering why. On the left, where the fork is resting: A huge glob of fat. Just look at that. That is a great deal of fat ringing a small spot of meat. And alas, that experience was very typical of the numerous pieces of steak we had at Sparks. It just does not match up to Keens or Lugers. Now I know that fat is flavor when it comes to meat. But this is not trimmed properly for a tier one steakhouse. Seems to me the approach they have is “We already got you in the door, there’s plenty of sizzle, and if the steak isn’t that great, who cares.” Well, that is a lousy approach. The char was good, but the meat was forgettable and to a certain extent gross. I should say this. For four of us, with drinks and a bottle of wine, the bill came out to $500 with tip. That is comparatively less expensive than Luger’s and Keens, which I am glad about, because the steak doesn’t compare. 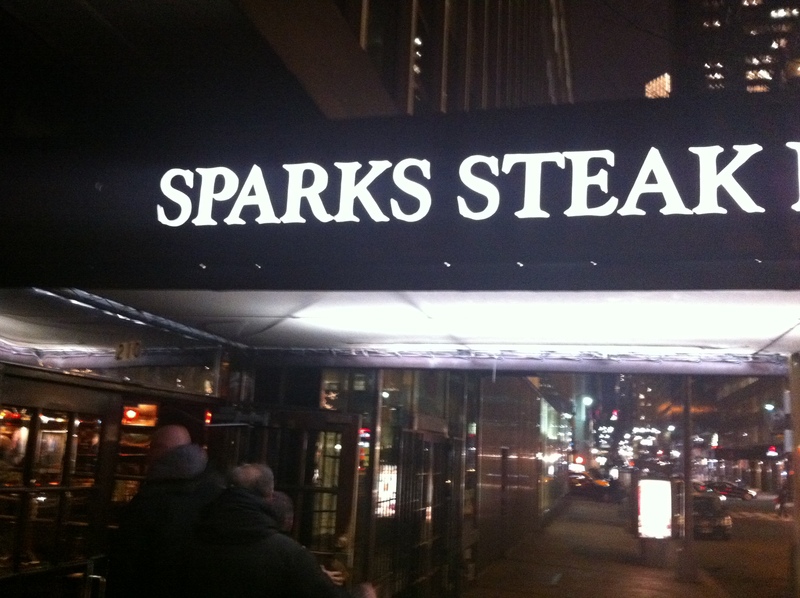 I can’t recommend Sparks to people looking to have an authentic New York City steakhouse experience. If you’re looking to be able to tell a tourist “This is where Paul Castellano got whacked,” go to Sparks. If you’re looking to tell that same tourist “This is some of the best steak in town,” you definitely can’t. 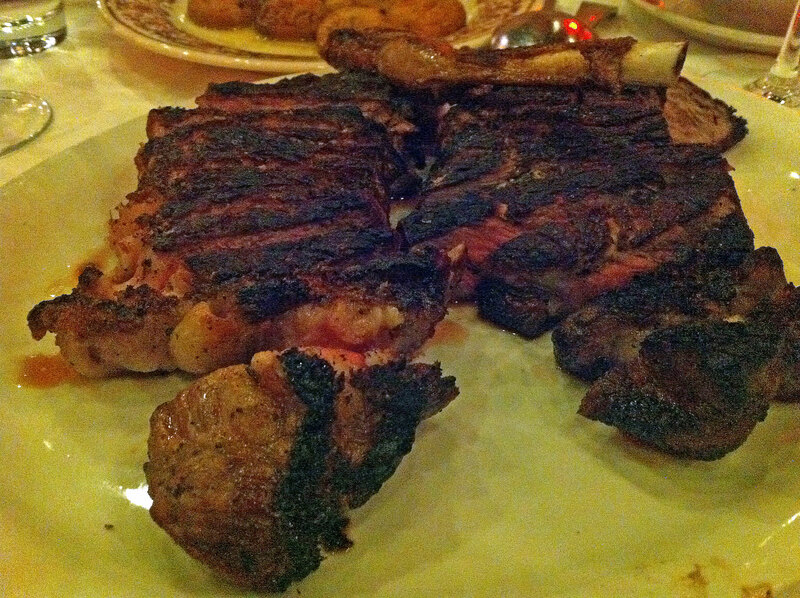 At the end of the day, Sparks is a steakhouse that fails the steak test. That review strikes me as absolutely right. why do they need ot serve bacon? their thing is beef not pork!!! !